Product reviews, both from users and experts, are an integral part of the shopping process. Generally, I scour the web for both negative and positive reviews, across multiple sites before purchasing ant type of gadget. Product recommendation research engine Wize has launched a redesigned version of its platform that aggregates reviews from across the web. 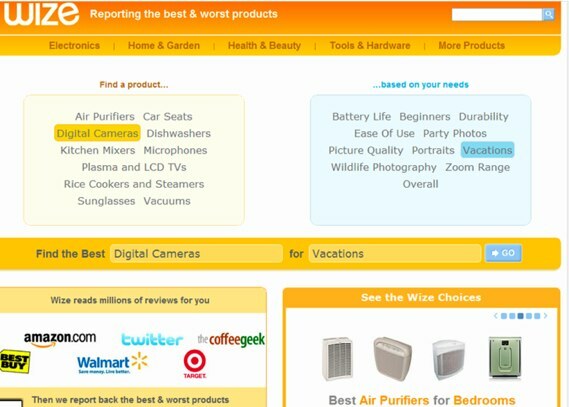 Launched in 2006, Wize lets consumers search for reviews on electronics, home goods, video games, health products and more. It searches shopping sites with user reviews, such as Amazon and BestBuy, as well as expert reviews from traditional product review sites. Wize’s technology has been tweaked to read reviews across the web and then analyze what people have said is good, bad or important using real everyday language (i.e. Very Portable, Great for sports!). So shoppers can indicate in their product review search that they are looking for a camera that is “very portable” or “good for vacations” and they will receive recommendations with that language. 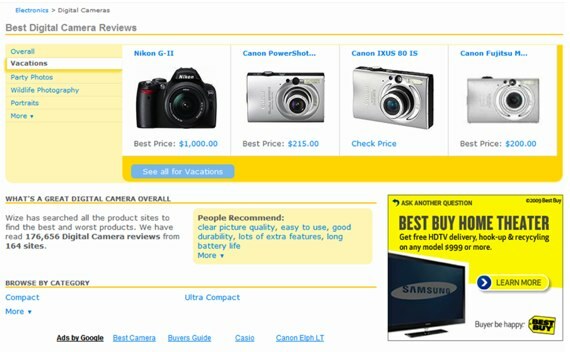 Along with a technology overhaul, Wize has added a host of new features including “Wize Choice Recommendations,” which is an authoritative opinion of the best and worst products available on the Web, based on Wize’s proprietary analysis engine; and gives users the ability to see reviews by product or by a category or consumer need (i.e. MP3 accessories). Wize will also let you save and organize your searches relating to a given product, making it easier to the user to save research. And Wize is becoming a little more social by pulling in real-time feeds from Twitter that have mentions of products. I’m a fan of Wize’s tweaked site, which gives consumers a in-depth look at what people are saying about a particular product. The startup, which has raised $4 million in funding, faces competition from Retrevo, ReviewGist and ViewScore.